Bishop of Paris, and martyr. Born in Italy, nothing is definitely known of the time or place, or of his early life. His feast is kept on 9 October. He is usually represented with his head in his hands because, according to the legend, after his execution the corpse rose again and carried the head for some distance. That, however, while still very young he was distinguished for hisvirtuous life, knowledge of sacred things, and firm faith, is proved by the fact that Pope Fabian (236-250) sent him with some other missionary bishops to Gaul on a difficult mission. The Church of Gaul had suffered terribly under the persecution of the Emperor Decius and the new messengers of Faith were to endeavour to restore it to its former flourishing condition. Denis with his inseparable companions, the priest Rusticus and the deacon Eleutherius, arrived in the neighbourhood of the present city of Paris and settled on the island in the Seine. The earliest document giving an account of his labours and of his martyrdom (Passio SS. Dionsyii, Rustici et Eleutherii), dating from the end of the sixth or the beginning of the seventh century and wrongly attributed to the poet Venantius Fortunatus, is interwoven with much legend, from which, however, the following facts can be gleaned. From the reign of King Dagobert (622-638) the church and the Benedictine monastery attached to it were more and more beautifully adorned; the veneration of St. Denis became by degrees a national devotion, rulers and princes vying with one another to promote it. 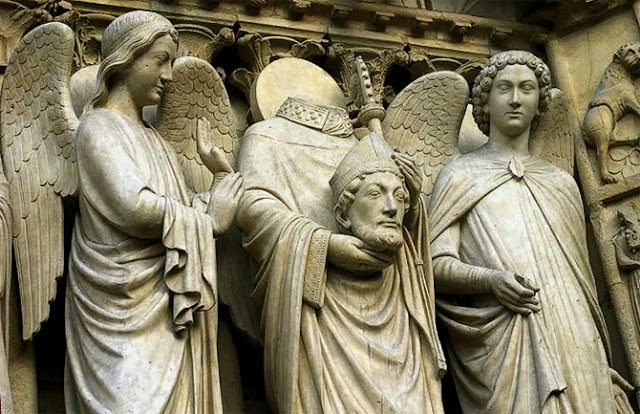 This development is due in no small degree to an error prevailing throughout the Middle Ages, which identified St. Denis of Paris with St. Dionysius the Areopagite, and with the Pseudo-Dionysius, the composer of the Areopagitic writings. The combining of these three persons in one was doubtless effected as early as the eighth or perhaps the seventh century, but it was only through the "Areopagitica" written in 836 byHilduin, Abbot of Saint-Denis, at the request of Louis the Pious, that this serious error took deep root. The investigations of Launoy first threw doubt on the story and the Bollandist de Bye entirely rejected it. Hilduin was probably deceived by the same apocryphal Latin and Greek fictions. The possession of the Areopagitic writings (since 827 in Saint-Denis) strengthened his conviction of this truth. Historiographers of the present day do not dispute this point. All attempts of Darras, Vidieu, C. Schneider, and others to throw some light on the subject have proved fruitless. Moreover, I beseech Thee to grant graciously, through the merits and intercession of this powerful Helper, the petition which through him I humbly place before Thee, devoutly saying, "Thy will be done on earth as it is in Heaven." Vouchsafe graciously to hear it, if it redounds to Thy greater glory and to the salvation of my soul. Amen. O GOD, Who didst confer Thy saving faith on the people of France through Thy holy Bishop and Martyr Denis, and didst glorify him before and after his Martyrdom by many miracles; grant us through his intercession that the Faith practiced and preached by him be our light on the way of life, so that we may be preserved from all anxieties of conscience, and if by human frailty we have sinned, we may return to Thee speedily by true penance. Through Christ our Lord. Amen. Christ after learning to know Him through the apostle St. Paul, and didst preach His saving name to the nations, to bring whom to His knowledge and love thou didst not shrink from Martyrdom; implore for me a continual growth in the knowledge and love of Jesus, so that my restless heart may experience that peace which He alone can give. Help me by thy powerful intercession with God to serve Him with a willing heart, to devote myself with abiding love to His service, and thereby to attain the eternal bliss of Heaven. Amen. My Lord and God! I offer up to Thee my petition in union with the bitter passion and death of Jesus Christ, Thy Son, together with the merits of His immaculate and blessed Mother, Mary ever virgin, and of all the Saints, particularly with those of the holy Helper in whose honor I make this novena. Look down upon me, merciful Lord! Grant me Thy grace and Thy love, and graciously hear my prayer. Amen. THE FOURTEEN HOLY HELPERS, Fr. Bonaventure Hammer, O.F.M.